Not only is the Orange-winged Parrot a noisy creature but it is the most common parrot in Trinidad and Tobago. These two features allow it to be seen regularly by birders and non-birders alike, despite its expert ability to be camouflaged among foliage. A bright green parrot for the most part, this bird also has namesake orange wing specula which are apparent when birds are in flight. Still there is more colour to this parrot than meets the eye. The Common Amazon Parrot, as it is also known, has some yellow on the crown and cheeks and blue above the eyes. The tail edge is also yellow with orange streaks on the outer parts. There is even some blue on the inner wing. Put this all together and you get a stunning display when wings and tails are outstretched. 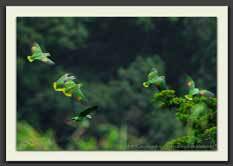 This is a common sight during the rain, when parrots spread their tails and wings to flaunt their hidden beauty. At 13 inches in length the “Green Parrot” is a large one. You can as easily spot these birds flying through the capital city Port of Spain as you can though the forested corners of the country. Large flocks are often heralded by cacophonous squawks. Once settled on branches these parrots will quietly feast on flowers of the Immortelle (Erythrina poeppigiana), fruits of palm trees, hog-plum (Spondias monbin), mango and many other flowers, fruits and seeds. Their breeding season peaks from late February to March and young ones are ready to fly after two months. In many countries, these Amazon Parrots are known to be loveable pets although they are less loquacious than other species. As in several parts of the island, they create a spectacle roaming free in the hills of the Arima Valley.